HMRC collected over £5bn in Britain’s most hated tax in 2016-2017. Inheritance Tax is charged at 40% on any assets remaining on death worth more than the Nil Rate Band (NRB) of £325,000. The new Residence Nil Rate Band (RNRB), introduced in April this year, adds a further £100,000 if leaving a share of your property to lineal descendants. According to the government, but only with figures available for the 2014-2015 tax year, how much you pay depends on where you live. It will come as no surprise that London and the South-East account for a large share of the population caught in the IHT trap as a result of increasing property prices. 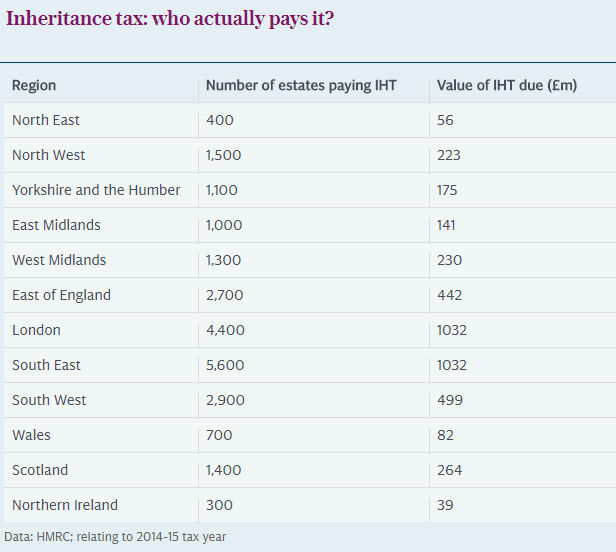 The data also shows parts of the country where only a tiny proportion of people will pay IHT. In Northern Ireland, only 300 estates a year pay the tax while the London Borough of Barnet alone has 360 estates expected to pay the tax. It seems that people living in near mansions in the north pay nothing and Mr Average in his 3 bedroom semi in London is going to get clobbered. Inheritance Tax is often a double Whammy! The continued application of inheritance Tax on assets that are left to a beneficiary, which usually increases their own estate, usually ends up with IHT being paid again on the same assets when passed down to future generations. See example below. There is no IHT between married couples making the situation worse for unmarried couples as they are deemed to be single. Unmarried couples and childless couples are also further discriminated against as they will not qualify for the additional RNRB. Where a couple is married and they have assets above two NRB’s & two RNRB’s there will be IHT payable for the beneficiaries without the correct planning. As well as IHT, the correct planning can also protect assets for the beneficiaries against care fees, divorce and creditors.